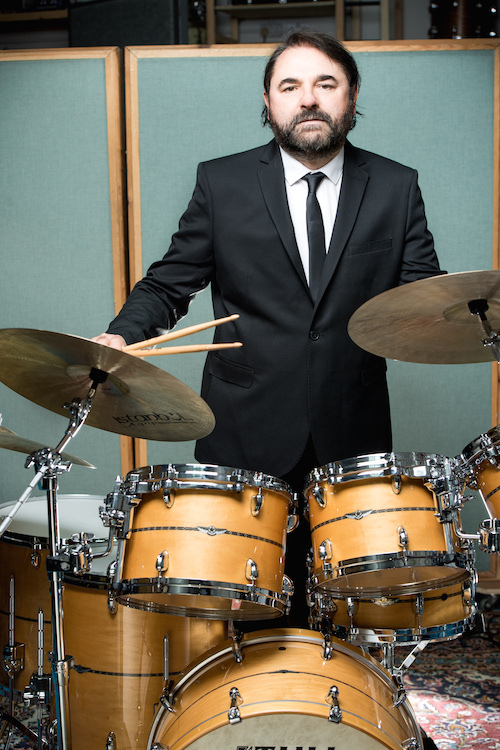 As one of the UK’s top session drummers Jeremy Stacey’s long lasting career has filled his CV with some of the biggest names in the music business. Over the years he has recorded, gigged and/or toured with the likes of Ryan Adams, Sheryl Crow, Steve Wilson, Mary Chapin Carpenter, Neil Diamond, Tom Jones, Ethan Johns, Eric Clapton, Paul Young, Robbie Williams, Gary Barlow, Sia, Zero 7, The Finn Bros, Chris Robinson’s New Earth Mud, Jason Rebello, Echo and the Bunnymen, Madeleine Peyroux, and many, many more! 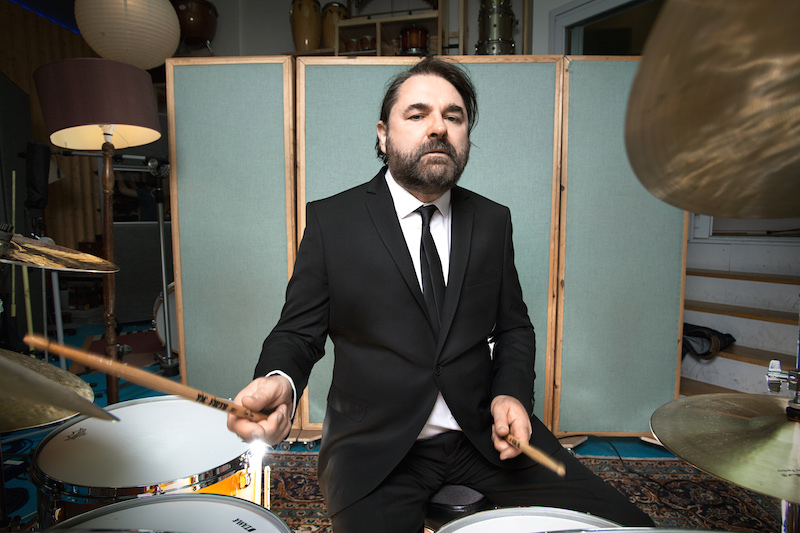 Having spent the last few years mainly on the road with Noel Gallagher’s High Flying Birds, Jeremy joined King Crimson’s 3-piece drum section, reinforcing Gavin Harrison and Pat Mastelotto, a year and a half ago. 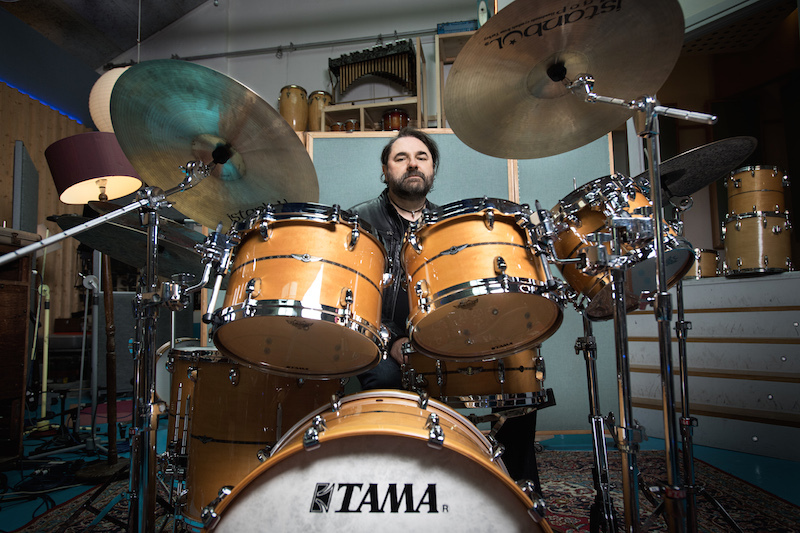 I caught up with Jeremy at the UK Drum Show to talk about his way to keep his busy career fresh and interesting, the challenges of the gig King Crimson and his extensive passion for drum gear. You’re doing loads of sessions. Now most drummers like the familiarity of using their own gear, but you once said you very much enjoy it if it’s not your own kit. I’ve never had a definitive set up. When I’m touring it tends to stay the same. 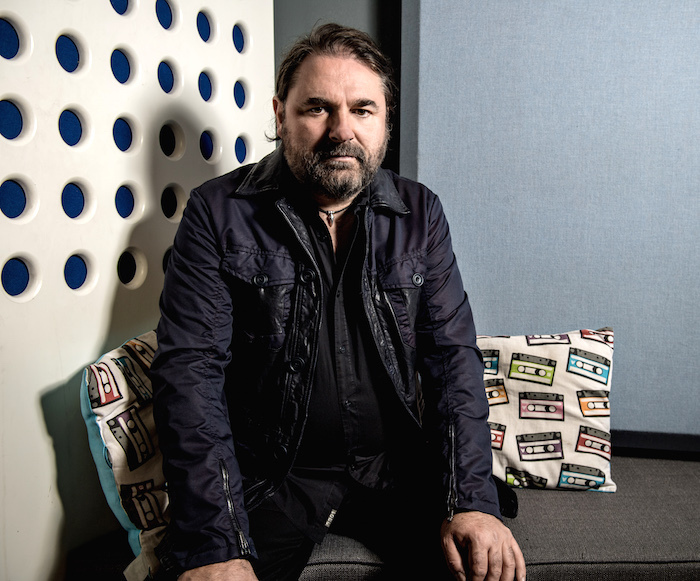 In the studio it’s a different story – whatever the music dictates. I’m not really sure where the idea for using different kits came from initially, I’m certainly not the only person who does that. A lot of L.A session drummers do exactly the same thing. Another reason might be playing in jazz clubs. There are always house kits in jazz clubs and most drummers tend to use them. It’s still like that in London and in New York. There’s something cool about it. It could be the worst sounding kit ever, but you’ve got to make music and get inspired, even if it’s not what you’re used to. Because I don’t have a set plan, and the drums are really just sounds, you can explore and have fun with it, I mean why does it have to be ‘my sound’ or even a regular drum kit? After I’ve listened to the demo or the artist playing the song, I quite often imagine who I would use on the track if I were producing. The kit often helps push me in a direction. So lets say I imagine Ringo Starr playing on a track so I might use a 60’s Ludwig kit, or John Bonham, I’ll use a 26″ kick etc. It’s kind of obvious really, and perhaps I don’t hear any drums on a track at all. Sometimes I‘ll just grab metal dustbin, or any bits and pieces music stands, whatever, and just add it to the kit or make up a kit on the spur of the moment. If you have a great creative engineer you can come up with some cool things. It also means you’re probably not going to play a regular thing, and hopefully make an interesting part that works for the song. I’m not interested in playing my latest licks or trying to show what I can do as a drummer. I really enjoy it when I turn up to a session and they say: “Do whatever you want”. They want your contribution and most of the time I think that is when the artist and the producer will get the best out of me. I think with this approach you’re more likely to create a unique sound as well. Yes, I think so. 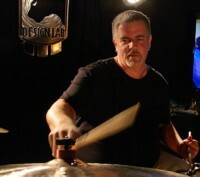 One of my favourite drummers, Steve Gadd, I believe always used the same set up, so the opposite approach. The stuff he did in the 70’s – early on with the Pearl fibreglass toms, and then of course the Yamaha Recording Custom, blue oil-filled Evans heads. I loved it. He was the first one that I’m aware of mounting rack toms on the side instead of floor toms with legs, so more sustain and bottom end. Recording was moving away from the open 60’s sound with few mics, spillage, and was more controllable, separated sounds, close mics etc. The other thing is most of his old K Zildjians seemed cracked or broken, everything taped up too, if look at some of the old pictures. That might be considered ‘out there’. A totally unique player, incredible feel, and his style works on everything, popular music, jazz, all genre’s. Yet you always knew when it was Gadd but it never overshadowed the music. A one-off without a doubt, and he’s still playing great. Is this approach what keeps it fresh for you over such a long career? Yes! I tried to copy Gadd in my teens but realised that copying is pointless. Even though, you’ll always be affected by your influences – all the different music and players you’ve listened to – you are always you whatever. I think my playing has changed drastically over the years because of listening to so many different types of music. For the last 10-15 years I’ve really been checking out a lot of different music and drummers. I still listen to all my heroes from the past, and then there’s Nate Wood, Dan Weiss, Zach Danziger, Keith Carlock, Ari Hoenig, Mark Guiliana, Josh Dion, Nate Smith, Marcus Gilmore, Louis Cole, Daru Jones, Justin Faulkner, Joey Waronker to name a few. There are so many incredible players, I couldn’t even begin to play like them, or name them all, but listening to them has had an influence. At least five years in the end. I did the first two albums and I’m on some of the new record which came out in October. I’m no longer in the band – another favourite drummer and friend, Chris Sharrock, is playing with him now. He was in Oasis and Beady Eye, the La’s and was Robbie Williams’ drummer in the ’90’s and in World Party. Chris and I actually have an interesting history because I saw World Party when I was in my late 20’s and it had a huge impact on me. It was 1988 I think. Guy Chambers was on keys (who I ended up being in The Lemon Trees with), Jeff Trott (who was Sheryl Crow’s guitarist and co writer) and the main guy Karl Wallinger. They blew me away. It was very musical, natural, and Chris made me rethink my playing. Six months later I got the call from Guy Chambers to be in what became the Lemon Trees. While touring with the Lemon Trees I met the guys from the band Jellyfish, who we opened for on their UK tour back in the early 90’s. We also opened for Suzanne Vega, and Mitchel Froom, the producer, was in her band at that time. Both Mitchel and Tim Smith (bass player with Jellyfish, Sheryl Crow and guitarist with the High Flying Birds ) suggested me for Sheryl Crow’s band. So you see, one gig seeing Chris play, and feeling inspired by a different style can have a long term effect. I started really checking out The Beatles, Zeppelin, The Who, Bowie and The Beach Boys etc – because up to that point I was really a jazz fusion drummer. I was totally into Tony Williams, Cobham, Lenny White, Gadd, Porcaro, Harvey Mason, Andy Newmark, Jeff Tain Watts, Gary Husband, Jack DeJohnette, Elvin etc. I still love all of them, but slowly over a period of time, I changed my style. I had also spent many years being obsessed with being really tight and trying to play perfectly with the click. I put that aside, and went for a looser wider feel. It also made me much more aware of drum sounds, and what a difference it makes. It was good move at the time – even though I think some thought I’d gone mad. If I hadn’t checked out all that stuff I don’t think I would have known the references for Sheryl Crow, Noel Gallagher etc. Learning how to play a song I suppose. To sum it up it’s good to understand as many genres as you can, you can’t just become a rock drummer overnight, you need to have some history under your belt. Was it just time to move on? With Noel? It’s a little more complicated than that. I had a great time playing with Noel and he is an incredibly talented and funny individual, and it’s a shame it had to end. I was going to leave anyway, and out the blue, I got a call from Gavin Harrison asking if I’d be interested in playing with King Crimson. Bill Rieflin who had done the previous tours wanted some time off, so they needed someone who could play drums and keyboards. It was a temporary position originally, but it has ended up continuing which is great. It was something I had to do musically. Let’s talk about the King Crimson gig. Three drummers?! Three drummers, yes! It’s a great experience to play with two other drummers, it’s like nothing else I’ve done before. Gavin and Pat are both great of course, and we’re very different players, which makes it interesting, and educational. Gavin creates a good percentage of the parts when we are playing together, and then we split things up to play individually. What’s great, is that I’m such a fan of Bill Bruford! He and Phill Collins were two of my earliest influences, in fact I saw the band ‘Bruford’ in the early ’80’s opening for Brand X (not Phil Collins drumming that night but Mike Clark). It’s been great to really dive in and listen to Bill again, his drumming with King Crimson is phenomenal, a completely unique fantastic drummer. Originally it was gonna be 30% keys – 70% drums but it’s ended up 50/50. I hadn’t played keyboards live for 20 years, so it was a bit daunting. I get some nerves playing drums live, but keyboards is a whole different thing; and that took a little while to settle. Having had such a long successful career already it must be nice to still find new challenges. It is and that’s what I live for. I still do gigs down at the 606 jazz club. I love the challenge. It feels good having to get some new music together with, if you’re lucky, one quick rehearsal on the day. I try to do my own gig where I play some different music Still, even if I’m busy I will usually do it because it’s great learning new stuff. No, in certain circumstances I might do it but I’m not a teacher and I will not teach conventional things. I did teach somebody a long time ago, but it’s not really my thing. I get asked how I do certain things on records and I struggle to explain that. If it’s an easy groove, anyone can work it out. I don’t tend to think in patterns. In King Crimson there are a lot of patterns that Gavin has developed so we don’t interfere with each other or flam. I had to learn those, but when I’m playing, I’ll improvise. I say improvise, it’s not like a wild difference, it’s just that I try to play in the moment rather than having a set thing to do. Sometimes I get asked “What’s that fill you played there and can you repeat it?” Maybe, I can transcribe it and play it back but then I might need to practise it. I had this on a session recently: I had done a drum track and they loved it but they wanted to change the sound. They hired me again to recut the track but they loved this one fill I had done originally. It wasn’t hard, but it took me a few goes to replay that fill that I had just played naturally before. Briefly going back to King Crimson: how did you approach rehearsals at the beginning with three drummers in the room? Gavin very sensibly suggested that I come over to his place, and school me in what I had to get together. I had recordings of what Bill Rieflin had done, and to start with I had to copy his parts exactly. After a while a few things changed, and I adapted a few things. It was a lot of stuff to get together, and if you have songs that are 10 minutes long with no particularly repetitive bits it’s hard. Sometimes you’re sitting there for 16 bars not playing and you’re thinking “or was it 17 bars?”. You have to know it inside out. I got a couple of friends to transcribe some of the harder tunes so that I had music to look at. Even though my reading isn’t great, it was good to have it there, because you know exactly ‘this bit is a 9 bar section in 9/8 with this pattern’ and so on. Gavin tweaked it all with me, because once it came to full band rehearsal, I had to just start playing the songs. It was a little scary, but at least I felt like I had done the work. The keyboards were difficult to start with because I used Bill Rieflin’s keyboard rig originally (I have my own rig now). Getting used to his sounds and the way he patched things took a while. All that stuff was just as much of a learning curve as learning the music. Ok, I have to press this foot pedal down, press this button, change the reverb on this and now play the part for four bars and then go back to the kit. It was a bit of a nightmare to learn – but like anything, once you learn it, you’ve got it. Now I could probably do it pretty much on automatic – even though I totally object to being on automatic. You have quite an impressive drum collection. What number are we on at the moment? I don’t know. I’ve got about 30-odd kits in Los Angeles and 40 or 50 kits in London. How do you even pick which one to play from such a collection? I don’t even know. The thing is that sometimes I wanna use ‘that’ kit and it’s “Oh, where is it? Ah, it’s right at the back of my storage unit. I won’t use that one then”. I do try to organise stuff from time to time and move everything about though, so I know where everything is. The thing is when you arrive with a drum kit and there is a lug missing or something like that, it’s frustrating… it is complicated and I wouldn’t really recommend it to everyone. 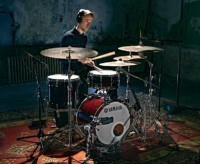 Most of my favourite drummers have one or two kits. It’s just a thing I got into. There is nothing like turning up to session with a kit you’ve never played, setting it up and going “I love this kit and I’m feeling inspired to play it!”. It makes you play differently. If you don’t know what that feeling is like, then there is nothing to say. It isn’t about it sounding perfect – it’s about getting a sound in that moment. Exactly! It is like that. I don’t sell them afterwards though. I mean, it’s stupid, it’s not a clever thing to do, it’s just something I ended up doing. I did a record with Ryan Adams called ‘Ashes and Fire’ at Sunset Sound in Los Angeles – it was my first time working with Glyn Johns. I said to Glyn I would bring three drum kits. He went: “What do you need three kits for, I just want one!”. I had bought this Camco kit in Los Angeles on eBay three weeks before and decided to try it on this record. I still had two more kits in the hallway secretly just in case. I set the Camco kit up, with the heads that where on it, I played it in the room and it sounded fantastic. I used it for the whole record and just loved playing it. Recently though, I’ve been using my Tama Star drums a lot in the studio. 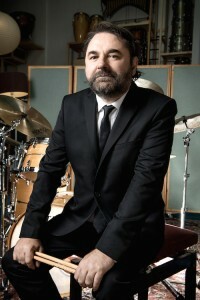 It’s great because it’s the first time with the endorsement situation where the drums record incredibly well, and I used them live with Noel Gallagher, and I play them with King Crimson. I think for the first time in my life I could actually…. …are you gonna use the words “settle down with a drum kit”? I could settle down yes, maybe. Ultimately I don’t care what the make of drums are really, or if they are new or old. I think if you know how to tune drums for yourself and get them sounding how you like, you can do it on almost anything. I say anything, don’t get me wrong, I have played some kits I really don’t like, I’m not a pushover. The Tama Star drums I’ve gone on about a lot, but they are really fantastic, in every way, tone, hardware, look. Tama have been so intelligent about every aspect of the design. I’ve loved them every time I’ve sat down and played them. As far as new drums I think they are pretty hard to beat. Big question: Studio vs. live? Studio. That’s my first choice. The studio because every project is different, new people, different musicians, and you get to hear what you and the other musicians have done. You can keep working on it till it sounds right. It’s a laboratory! You’re in a studio for maybe a week, two weeks or just a day. I’m starting from the beginning on each session. Playing live with a band, especially if you’ve played with them for a while, can be repetitive. Jazz isn’t like that, there’s an element of danger. Studio sessions have an element of danger too. You don’t know if it’s going to work, or if the artist or producer are going to like your playing. So yeah, the studio. You spend a lot of time in America, but you’re still based in London? Still based in London at the moment, but I do find myself drawn to America when it comes to music, and yes I have spent a lot of time there. Could I live there? Maybe. I love the recording studios, in Los Angeles especially. I like the attitude, I find it very positive, people make you feel good when you’re working. I have a lot of friends over there too. If I had more time, I’d go to New York, and take some lessons with my favourite drummers. Tony Williams went to music school to learn composition later on in his life, and I think that’s great. I find it hard to get perspective on my own playing, I don’t feel like I know anything sometimes. Do you know what I mean? And of course you don’t have to go to school, you can learn from anyone, any instrument. Every time I have one lesson, something changes, I get inspired and want to practise. I guess it’s a bit of a blessing and a curse that we never really finish learning in our job. That’s like life, don’t you think? If something works we might revisit it but the thing is… why keep doing it? It’s just a reproduction. I want to keep moving forward. I don’t know if my playing has developed because I haven’t got perspective on it, I just look for new things and new ideas and hopefully they will rub off. I love music, that’s the main thing. Thanks a lot for your time Jeremy!